Sorry that I haven't posted in a couple days...I have had the stomach flu (YUCK!). Josh was sick on Tuesday night and all day Wednesday and Thursday I was sick! I think I am finally on the mend. Someone from my church, who works for a hotel, needed some wedding favors for an upcoming event. She asked me for a few ideas. So here is the first one...a chocolate bar wrapper. 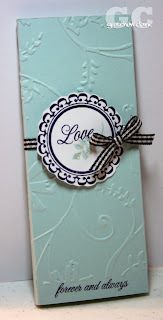 I used my Cuttlebug to emboss the paper, and used my PTI set Wedding Day. It's Wednesday already...boy the week is going fast...lol! I don't know about you, but I get so confused when it is a short week...I kept feeling like yesterday was Monday! 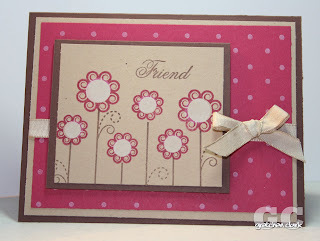 I am loving this flower image from the Papertrey stamp set Text Box. 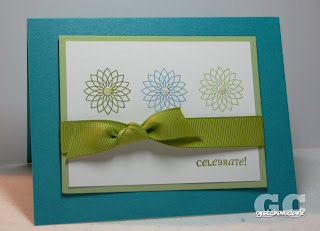 For today's card, I stamped the flower in three different colors and added Stardust Stickles to the centers for some Sparkle. I have been kind of unmotivated these past few weeks...with exercising (that is easy to become unmotivated about! 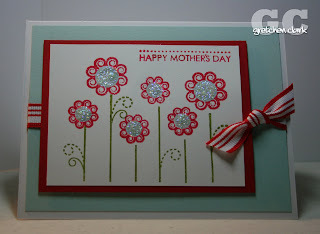 ), stamping and scrapping. Today I am going to use my elliptical for 20 minutes and hopefully get back into a routine...plus bathing suit season is upon us...arghhh! Hopefully once I start exercising again I will have more energy to stamp and scrap! If you like Weight Watchers, I found this cookbook at Costco last week. It has some great recipes (all the points values are on the website)! 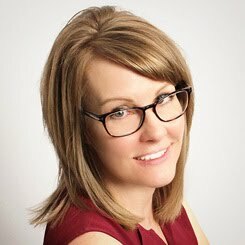 Plus the website is fun too! You can find it here. I definitely plan on making the onion rings this week (2 points). I'll let you know how they are. Isn't it nice to have a long weekend? I just love it! Although Mike and I are not doing anything really fun...we are painting the ceiling in our kitchen/dining room, (Mike is painting, I am supervising, lol!). I may try to get some digi scrapping/stamping done...but not sure (gonna play it by ear), we may just watch movies and eat (some of our best activities, lol!). I was busy stamping over the weekend, so I have some stamped goodies to post this week! so stay tuned!! And take a moment to day to remember our men and women in the military...because our freedom was not free! TGIF! It is finally Friday! I am so glad that the long weekend is here!!! Normally I have Friday's off, but with Ashley in Florida, I am still filling in. It will be nice to get back to my regular work schedule next week...I do have to say waking up later and going in to work for 9:30 has been kind of a nice change (I do prefer my 7:30-3:30 though). 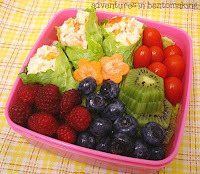 Unfortunately I didn't have time to photograph my latest stamping projects...so I thought I would post some pretty pictures of Bento Lunches. 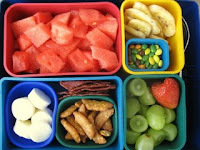 I just recently discovered this way of packing lunches, and I think it is way cool!!!! Although, I don't know who has time to create these beautiful lunches each and every day. I usually eat one of these for lunch. 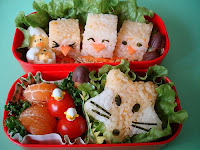 I would love to open up my lunch box and find a lunch like this! I truly believe that you eat with your eyes, and well, I would probably overeat if I had a lunch like this ever day. They do intrigue me! and I may try to doctor up my lunches next week. On a sad note, I just found out yesterday about the tragic death of Steven Curtis Chapman's daughter. More about it here *if you have a moment today lift up their family in your thoughts/prayers. 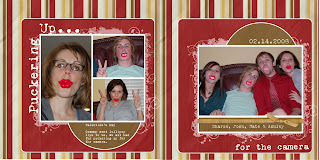 (*I don't read that blog...it just had great pictures of the Chapman Family). Our cable and Internet were out for about 6 hours yesterday...can you believe that? Boy, how we have become so dependant on those things! Mike was home around 2:30 yesterday, since we had an appointment to have our air conditioning units inspected (they are getting kinda old, and the downstairs unit hasn't been cooling quite as well). $500 later we have some freon added, a new switch of some sort and another appointment to follow up in a few months...CRAZY! but A/C is one thing you do not want to be without here in Phoenix!!!! So back to my Internet/cable outage...Mike and I were both home and just sitting on the couch, we couldn't get online or watch TV (crazy!) it was kind of funny! I decided to do some digi scrapping since I didn't need the Internet to do that. It was so nice when I heard the little "beep" my computer does when you get a new email...for 6 hours without Internet access, I got about 20 emails, lol! I did get a little stamping time in yesterday morning...it was nice getting my hands inked up again, ha ha! I still need to make some more cards, so hopefully on Friday or Saturday. 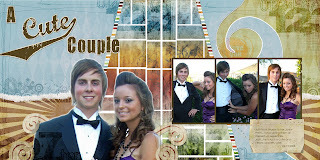 okay...onto the card: I made this one for Josh's birthday last Friday. 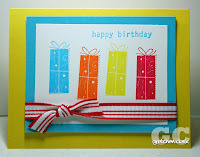 I used my new Papertrey in color collection. 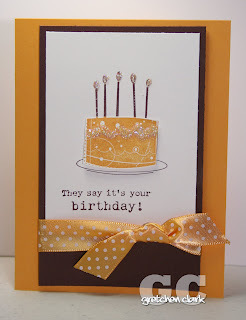 I really am loving their polka dotted ribbon...so cute! It is hard to see in the photo but I added Stardust Stickles to the cake (and popped it up with a dimensional) and candles...it was just asking for some "bling". I hope you are having a wonderful day. I am going into work late today (I love Wednesdays...it is our slow day at the office), and I have plans to do some stamping this morning. I have several thank you cards to make, so make sure to stop in tomorrow and the rest of the week for some stamping/card posts. 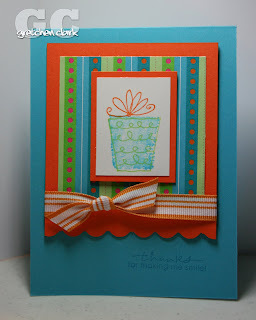 I have really been on a roll with my digi scrapping! I decided to start scrapping my most recent photos, rather than doing it chronologically (I always feel like I am behind...and get somewhat stressed out), this way I can scrap while things are fresh in my brain. These are some photos that were taken from my birthday celebration...I had just opened my new camera (see how big my smile is, lol!). 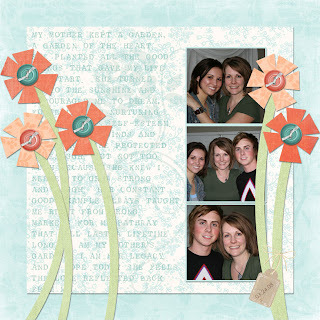 I used the kit called Unconditional and it looks more like a Mother's Day page than my birthday, but since I think my kids are AWESOME! I thought it was blog worthy. Enjoy your day! Thanks for visiting today!!! TGIF! I am so glad it is Friday. It was kind of hectic at work yesterday. Whenever a doctor is out for a few days and then comes back...the work load is pretty heavy. I am glad I have today off...but I will be doing a lot of running around. Brunch with a friend, Birthday lunch for someone at work, make Josh's birthday cake, wrap his gifts, go out for his birthday dinner, celebrate some more, and hopefully I can find some time to clean my bathrooms, and stamp/scrap!!! 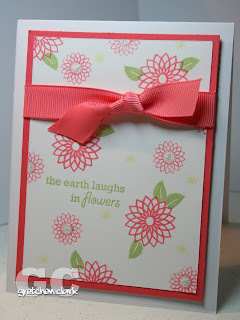 For today's card I used my Papertrey set Women of Life (again!). 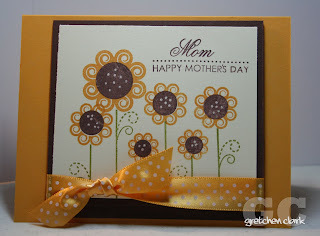 This is the card I made for my mom (I hope she doesn't read my blog today, lol!). I really like the new PTI colors, and especially the ribbon. Isn't this polka dot satin ribbon soooo cute? 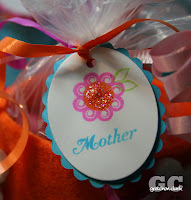 Have a wonderful weekend and Happy Mother's Day! Thanks for stopping by!!! I had a very productive day yesterday on my day off...I got my pantry organized, my laptop is fixed and running with a new battery after a visit to the Apple store, picked up my digi pages from Costco (came out great), organized my craft space and got all my digi kits unzipped and organized in my Acdsee program, and then made fajita's for dinner in honor of Cinco de Mayo. Whew...it felt great to get lots crossed off my list. 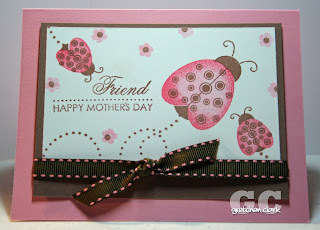 I haven't had any stamping time in a while, but I have a bunch of cards from last week. 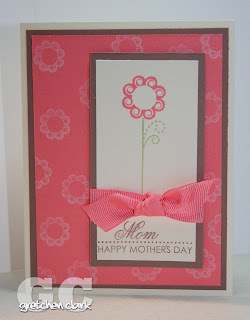 This is the card I made for my mother-in-law for Mother's Day. 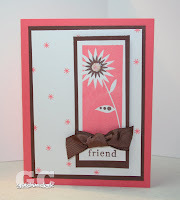 I used the perfect match collection from Papertrey...I love this color (berry sorbet). Thanks for visiting and I hope your Tuesday is Terrific!